Dean Yang (University of Michigan) presented a study he conducted on farmers in Malawi to the Microfinance Innovation and Impact Conference last week. He divided the groups into a control group, a group with savings accounts and a final group with a savings and commitment account. The goal was to track the rate of savings against the farm seasons to see of the trend of more frugal spending prior to the next harvest would continue. In other words, the aim was to see if access to savings would iron out the volatility of income for farmers. On the second day of the Microfinance Impact and Innovation Conference (#MFImpact), Abhijit Banerjee discussed the idea of the ‘missing middle’ in the opening panel hosted by David Roodman titled “What Don’t We Know That We Ought to?” Banerjee highlighted a business growth phenomenon that has yet to be explained. In short, there is an inability for small businesses to continue growing into reasonably larger businesses. The small ones will see some growth (measured by employees) when they have access to capital and fall off after adding a few. Businesses that are already medium sized, will see much more significant growth. Banerjee labeled this gap the ‘missing middle.’ While this is a fascinating topics that definitely needs to be further researched, I will leave it to Rohit over at IDP to fill the missing middle I am about to create (Update: Rohit delivers his post on the "missing middle." Go read it after you read this of course). At the invitation of Timothy Ogden and Sona Partners, I am covering the Microfinance Innovation and Impact Conference an event co-hosted by Innovations for Poverty Action, the Financial Access Initiative, Moody’s, Deutsche Bank and CGAP. These posts reflect my personal observations and thoughts. Given the semi-live nature of these blog posts, please forgive any typos, or unintentional errors or omissions. Also, many of these presentations are new and unpublished, so there will be little opportunity to provide links outside of what is described and shown at the conference. Please feel free to add comments if you have any questions/thoughts. The 40th floor of the Moody’s building. Not a bad day. At the invitation of Timothy Ogden and Sona Partners, I am covering the Microfinance Innovation and Impact Conference an event co-hosted by Innovations for Poverty Action, the Financial Access Initiative, Moody’s, Deutsche Bank and CGAP. These posts reflect my personal observations and thoughts. Given the semi-live nature of these blog posts, please forgive any typos, or unintentional errors or omissions. Please feel free to add comments if you have any questions/thoughts. There were two interesting findings that came out of this morning’s sessions. Duflo and co. found that offering microfinance to rural areas in Morocco which never had previous access to it lead to men leaving their wage positions and turn to personal farming. In addition, they found that money spent increased on the farms. In other words, the additional money did not cause people to spend money on new ventures, rather they invested in what they were already doing. Laura Starita covered of much of what was discussed in the opening panel in more detail (featured Esther Duflo, Dean Karlan, and Abhijit Banerjee). It is key to note that the findings from the Moroccan study are still quite raw. Though she said it quickly, Duflo said that it is only three weeks old. This is very exciting that the information was presented from a two year study, but means that there are still questions that have to be teased out (and more research that will come from the findings). The Future of Aid and Development? Mr. Canada and his charter schools have struggled with the same difficulties faced by other urban schools, even as they outspend them. After a rocky start several years ago typical of many new schools, Mr. Canada’s two charter schools, featured as unqualified successes in “Waiting for ‘Superman,’ ” the new documentary, again hit choppy waters this summer, when New York State made its exams harder to pass. This is where Sharon Otterman starts her piece in Wednesday’s New York Times. She proceeds to paint a more hazy picture of Canada’s Harlem Children’s Zone. With the change of testing standards, the HCZ has come back to earth with scores that are not as stellar as the money trail and program worship would lead one to think. At a cost of just over $16,000 a year per student (compared to $14,452 for other city schools), the HCZ affords the opportunity for smaller classes, trips around the world and long lines to get in the door. However, only 15% of 7th graders passed the English section of the 2010 NY state exam. Over all, 38 percent of Promise Academy I’s students in third through sixth grade passed the 2010 English test under the state’s new guidelines, placing it in the lower half of charter schools citywide, and below the city’s overall passing rate of 42 percent. 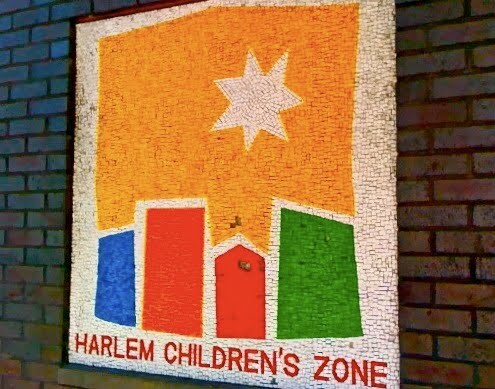 In Harlem as a whole, just 29 percent of children passed. So, on the upside, the rate of passing is significantly higher than the rest of Harlem. If students did not go to HCZ they would have a lower chance of passing the English section. While nice, the rate of 38% is far too low and Canada recognizes it. Promise Academy II, an elementary school that occupies part of a public school building, did better, with 62 percent passing in English, among the top 10 percent of charters. Both schools continued to outperform the city in math, with 60 percent passing in one school and 81 percent in the other. Math is a strength of the HCZ, but English is still a bit behind. The elementary school does significantly better and that gives reason to hold some level of judgment for the present third graders to move through the middle school. What else has the HCZ the done well? Its after-school college advice office has helped place 650 students in college, and it supports them until they graduate. Its asthma initiative has drastically reduced emergency room visits and missed school days among its 1,000 participants. Preschool students have made bounds in kindergarten readiness. Parent satisfaction in the charter schools, as measured by city surveys, is high. So, at the moment, it is fair to say that the jury is still out on the HCZ. There are things that they do well, but it is not a resounding success as media, such as “Waiting for Superman,” will lead us to believe. The concern is the fact that Canada is gaining more financial support and Secretary of Education Arne Duncan is talking about scaling successful programs. If the HCZ continues to find success, then there can be tools learned from the model which can be applied to cities. However, it is wrong to assume that a program that works in Harlem will be successful in Los Angeles, let alone the Bronx. It is also concerning that the leading reform ideas are trapped within the current educational structures. This RSA talk by Sir Ken Robinson offers some evidence that shows what is wrong at the root. He picks out the problems and offers some solutions that do not simply work within the current educational structures. I would venture to guess that those involved with “Waiting for Superman” did not intend this to be such a significant takeaway. Guggenheim was sure to take the time to say that he did not want to oppose unions as a whole. In his question session after the film showing in Philadelphia, he expressed how he likes unions and is a union member. This is great to know when hearing him speak, but how many people who go see the movie will have the chance to have him answer their questions after the film? Since I am a fan and nobody has done it, I will be the one who goes with Dave Matthews singing about colonialism. This post is my contribution to Change.org’s Blog Action Day 2010, an annual event that unites the world’s bloggers with the goal of sparking discussion and collective action. This year, more than 3,000 bloggers are writing about water, a global issue that affects everyone. I made this video last year to illustrate the process I personally had to go through in order to have a glass of water while living in Kenya. The video quality is pretty terrible, so please forgive me as bandwidth did not allow for a better version and I did not save the original. Other blogs have and will discuss the impact of water issues on the undeveloped world. I want to do something slightly different and show how it affected my life for a year. That is not to put my experiences on par with people who struggle for water on a daily basis. I always had the option to buy a bottled water if I absolutely needed it. My point is to show how the lack of clean water can cause a shift in the way one can operate . With much time and energy spent in regards to water, the energy spent collecting, storing and treating water can prevent people from doing other things. Collect water to be filtered. Store filtered water in bottles. The lack of clean water means everything. African women walk over 40 billion hours each year carrying cisterns weighing up to 18 kilograms to gather water, which is usually still not safe to drink. After that, the water should be filtered and boiled. However, as it is additional work to gather firewood and costs money to have a reasonable water filter, water is often boiled every so often and generally delivered as tea or coffee. Many times it is drank untreated; exposing the consumers to waterborne illness. I had it easy compared to everyone else, yet water dominated my life. It meant that I could shower 2-3 times a week (sometimes more or less depending on water), dishes and clothes had to be washed in bulk to conserve water and developed a relationship with rain as if it was a person. Maybe I became a little sensitive to it, but the fact is that for a person who did not have to struggle at the same level as others; it meant that it was a significant burden to the rest of the community. I make no claim to be an expert, only a person who has a small level of personal experience. Because of this I will make no large claims. The fact is that the solution is to provide the ability for every person to access clean water in their homes. Some will suggest that we can play a part by taking shorter showers, hand washing dishes, never leaving the water running and so on. It is nice to think that we can turn off the shower when lathering up and save the world. There is an ease to this action. However, how does that bring clean water to Cameroon? I am not suggesting that water conservation is not important, but let’s not connect it to the problem that affects billions of people. This is a nice exercise in bringing about awareness in terms of clean water, but it is an issue that is far more complicated than a single post can cover. Even the solutions that are touted (playpumps) are not always sustainable solutions. This is an infrastructure issue. Water issues have to become a part of the entire package of development. Resources have to be allocated to work towards providing clean water solutions. This includes proper latrines, running water, clean water and high availability of all resources. You have to check out this post on the Tao of Water. It is a fantastic meditation on water that everyone should read. *I don’t usually offer petition links, but since I am participating and they will be broadcasting my post, the least I can do is provide the above banner to the change.org petition. The Gates Foundation wants you to know more about global health. So, they are kicking $1.5 million to ABC for a year long series on the subject (ABC is tossing in $4.5 million of their own as well). Caroline Preston over at Philanthropy.com seems to go with not so good. While she does not directly opine, Preston focuses on reactions from two opponents. The first, USC Prof Marc Cooper, is disappointed by the fact that the money was spent on ABC rather than programs. Second, Robert Fortner, questions how such a project funded by Gates can adequately explore criticisms of the foundation (sorry for being vague, I am trying to be quick and also direct traffic to Preston’s article). Cooper has a silly concern as the amount of money spent is relatively nothing compared to the size of the Gates Foundation. The money can easily be replenished through investments in no time. It is a bit of a Senator Coburn-esque move to worry so much about such a small part of a much larger organization. However, it is problematic to have media coverage paid for by an individual. I personally believe that press should be as free as possible. There is a need for funding, of course, but there becomes a conflict of interest when money comes in from a source who wants their story to be told. Can ABC really dig into the way that the Gates Foundation works and offer up real pieces that examine what is done? I would argue no. It is mostly because Gates want the series to focus on the fact that there are growing global health issues which people need to care about. To me, it seems to be nothing more than an advocacy campaign at the core of series. It is natural for the Gates Foundation to want what they are doing in global health to be featured and for it to be seen in a positive light. If they are shown as anything less than great the investment is a waste. Questioning the Gates Foundation could lead people to support other initiatives. They do not want that (who would?). I am not convinced this is an entirely bad thing. Global Health needs attention in the U.S. and other developed nations for a commitment to the Millennium Development Goals and other aid to be maintained by governments. I posed the following question on Twitter when the ABC announcement first came out: If you were a foundation (or a donor with a lot of money) and wanted to put money into educating the public on issues like Global Health where would you put it? The Gates Foundation wants to raise awareness about their product so they're doing what so many other organizations do--product placement. When a character on a TV show goes out of their way to show me OnStar in their new Buick, I see it for what it is--an ad. But if I'm going to buy a car, I'm still going to investigate my choices. In this case, I might just include the Buick in my research. People want to see that the money Gates, the Global Fund, and OGAC is spending isn't going to waste. What better way to show that global health programs produce results than through a fancy advocacy campaign? Will it be totally truthful? Probably not. But I think most people know they can't believe everything they see on television. I understand these point, but they are not good enough for me. Information is one thing, but it can be harmful if it is wrong or presented with the intent to garner support for an organization. Again, I can understand what is wanted out of such a deal, but believe it to be series that must be watched closely. For example, I would love to see NBC do a follow up the next day to check facts and flesh out what was not fully explained in each episode. I think that we have to do much better in regards to providing education, but it will also require a major social shift. In my next planned post, I will look at why development/aid is not very important to the United States verses other parts of the Western world. This was originally posted on the Huffington Post. Geoffrey Canada opens “Waiting for Superman” with a story of how, as a child, he was drawn to Superman as a hero because he would sweep in and save those most in need. This provided a hope that no matter how bad things got, there was a chance that Superman would sweep in to the rescue. When he realized that Superman was not coming he knew that, “No one was coming with enough power to save us.” It is appropriate for a film who’s title references a superhero, the Davis Guggenheim narrated and directed documentary, features a list of heroes and villains in the world of American education. Thousands of police took to the streets yesterday in a failed coup over a new law they felt jeopardized their benefits. However, many in the US media barely covered the story as it unfolded. Blogger Tom Murphy from The Huffington Post said the media opted not to cover the story based on a belief that Americans are only interested in what happens in the United States and not the events taking place elsewhere. He argued that this continues to be a problem with all international and global issues. So, my first live interview ever after I published this about the coup in Ecuador. I was hoping that we would not have to touch on Chavez or any of that, but it was asked and I did my best to answer without going too far. I think it went decently well for a first time and would love feedback about anything in regards to the interview. Who knows, might have to do one again in the future. Those who follow with RSS got a view of my review of "Waiting for Superman" by mistake. So you are the lucky few. Huffington Post is working on getting the Education section up and running soon, so it has not posted there yet and I want it to be there first. So, we will have to wait another week.